Bob the Builder was never this cool. And while Barbie may have a dream palace, Goldie probably helped build it. GoldieBlox is an engineering toy for girls aged 5–9 created by US engineer Debbie Sterling. Perturbed by the dominance of men in the field –‘The scary truth is that only 11% of engineers are women and girls start losing interest in science as young as age eight’ – she decided to take the problem into her own hands. 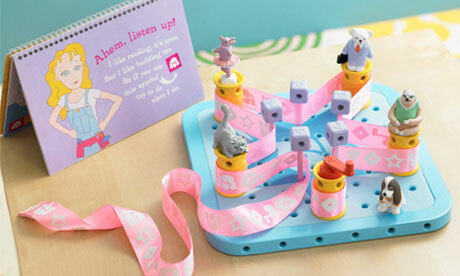 GoldieBlox is a combination of visual and spatial; a story book and a construction kit. This comes as a result of Sterling’s consultation of more than 100 school children – she believes that girls want to know the reason behind the building and are not satisfied with the building alone. To that end, children follow overall-and-construction-boot-clad heroine Goldie as she meets and overcomes a series of engineering challenges. Children build machines as Goldie does and together, they solve the problem (along with a colourful cavalcade of animal sidekicks, of course. My personal favourites are Phil the sloth and Flavio the Brazilian bear). While certainly a noble attempt at encouraging girls down the engineering route, GoldieBlox does raise some concerns. Full of pastel pinks, yellows and blues and complete with ribbons to pull and twist (all ‘innately appealing to girls’, according to Sterling), the toy does run the risk of further entrenching gender-specific toys. That said, if GoldieBlox helps normalise science and construction for young girls (and encourages parents to think that these things aren’t strictly a “boy” domain) then GoldieBlox could be a net-win. One problem at a time, right? GoldieBlox is currently in production. You can track its progress at its website. This entry was posted in Culture, Featured and tagged gender, in brief, News. Bookmark the permalink.